Monday 30th July saw the publication of the long-awaited final report into the disappearance of flight MH370, a Malaysian 777-200 aircraft flying from Kuala Lumpur to Beijing which vanished on 8th March 2014 after sending a final, routine, sign-off message to Kuala Lumpur Air Traffic Control. The final report was a product of all of the countries involved in the search and included the analysis of the few wreckage pieces found to date, running in its total length to well over 1000 pages. Alas – and, for many, predictably – it failed to answer virtually all of the key questions that remain, over four years since the aircraft vanished. It also contradicted some significant assertions made previously by the Malaysian authorities such as when, exactly, the aircraft reappeared on Malaysian Primary Radar after initially vanishing at or around waypoint IGARI: the ‘hand over’ point from Malaysian to Vietnamese Air traffic Control. 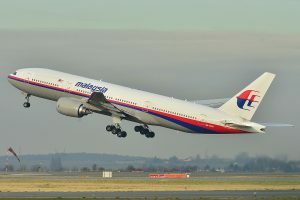 And many unanswered questions still remain, including when, exactly, the Malaysian authorities first realised the plane had deviated so markedly from its original, intended, flight path, who took control of the aircraft in order to divert it, and – most crucial of all – why the satellite communication system (SATCOM) rebooted in-flight at 18.25 UTC after an interrupt that the report asserts could have lasted for anything from 22 to 78 minutes. The SATCOM question is key. Rebooting in-flight is highly unusual and suggests some sort of restoration of power to the Satellite Data Unit after a prior interruption. Much rests on it, given that without this restoration of power there would have been no sequence of ‘handshakes’ with the INMARSAT satellite which allowed investigators to subsequently determine that the aircraft had reached a terminus somewhere in the vast Southern Indian Ocean. I was surprised that the final report did not spend more time on the reboot question. In its conclusion the report states that it is not known why the SATCOM behaved as it did. The 18.25 log-on is described as “abnormal” and the report sets out various possible explanations for this. What it freely admits in its conclusion is that analysis cannot explain why the SATCOM rebooted at all. There have been many attempted explanations from elsewhere, of course, including that of aviation expert Jeff Wise, whose excellent blog on MH370 continues to be an island of sanity in what has often seemed to be a sea of confusion. Wise cites state-sponsored hijacking as an explanation for MH370’s disappearance and he points the finger of blame firmly at the Russians in a complex thesis in which he argues that an on-board hack into the plane’s Satellite Data Unit resulted in a false data trail leading authorities to the Southern Indian Ocean in search of wreckage when in reality the plane was taken North to an airbase in Kazakhstan (and is presumably still there). Of course, such a thesis is itself open to question at many points and fails to explain why so many pieces of aircraft wreckage have washed up. In this regard it is worth noting that the final report into the disappearance also included, as one of its appendices, the long-awaited French report into the flaperon that washed ashore on the island of Reunion in July 2015, some sixteen months after the aircraft disappeared. Distinctive damage to the flaperon’s trailing edge led some at the time of its discovery to speculate that it had been torn off MH370’s wing during a rapid descent at the point of fuel exhaustion. This was of more than mere theoretical interest as it implied a near-vertical final dive which would in turn indicate that the aircraft wreckage could not be far from the last recorded ‘handshake’ between the aircraft and the satellite. However, information contained in the much-delayed French report contradicted this vertical descent scenario and indicated instead that the flaperon was still attached to the aircraft when it hit the water. If correct, this would strongly suggest that MH370 was still under somebody’s conscious control at the very end of its flight and might therefore have been manually glided a considerable distance from the location of the final ‘handshake’, thus increasing considerably any potential area in which wreckage might be searched for. The report, together with accompanying comments from Malaysian authorities, signally failed to assign any direct blame for the aircraft’s diversion, although it did all but entirely rule out the possibility of mechanical error. In fact, it simply reiterated conclusions already contained in the previously widely-leaked Royal Malaysian Police report into the disappearance which stated that there was nothing to indicate that either Captain Zaharie Ahmad Shah or First Officer Fariq Abdul Hamid was responsible for the diversion at waypoint IGARI. In fact, the final report left very much open the possibility of third party involvement in the disappearance without specifying who the third party – or parties – might have been. For many, this conclusion was somewhat disingenuous, given that the behaviour of the aircraft at and immediately subsequent to the initial diversion gave a strong suggestion that it was being flown by someone with considerable knowledge of Boeing 777-200 systems. Although analysis of the data from the flight simulator in Captain Shah’s home basement turned out to be inconclusive – and very far from straightforward – his considerable experience of flying Boeing 777 aircraft and his known interest in various aspects of their operation has led many to the conclusion that it was he who took the plane: perhaps by first locking the inexperienced First Officer out of the cockpit with some simple ruse. But even here a mystery remains. In the history of commercial aircraft murder-suicides in which pilots have taken planes and then deliberately crashed them there is nothing remotely comparable to MH370. In particular, the very large amount of time that elapsed between the plane’s initial diversion and subsequent terminus cries out for explanation. Could the taking of MH370 have been as a ‘bargaining chip’ in some sort of negotiation that was simultaneously taking place on the ground? Might this explain the possibility – based on analysis of the INMARSAT data – of a fifty minute-plus loiter in which the plane could have been circling before it set off on the final leg of its tragic journey? And might the 18.25 reboot have been caused by the aircraft automatically restoring power to its systems after an earlier interruption caused by some sort of damage to it? The reboot coincided almost to the minute with the aircraft’s passing out of Malaysian airspace: could this be simple coincidence or something more? These are just some of the questions that remain, even after the publication of the final, massive, report into flight MH370’s disappearance: a disappearance that remains the single most baffling aviation mystery of our – or any – time. Thanks for this interesting summary and the questions it highlights.